If it were not for the presence of the gas port, this same equation would apply until the instant that the projectile leaves the muzzle. However, after the projectile passes the gas port, the pressure in the gas cylinder rapidly rises and starts to drive the piston to the rear. This pressure acts both rearward on the piston and forward on the front projection of the cylinder bore. 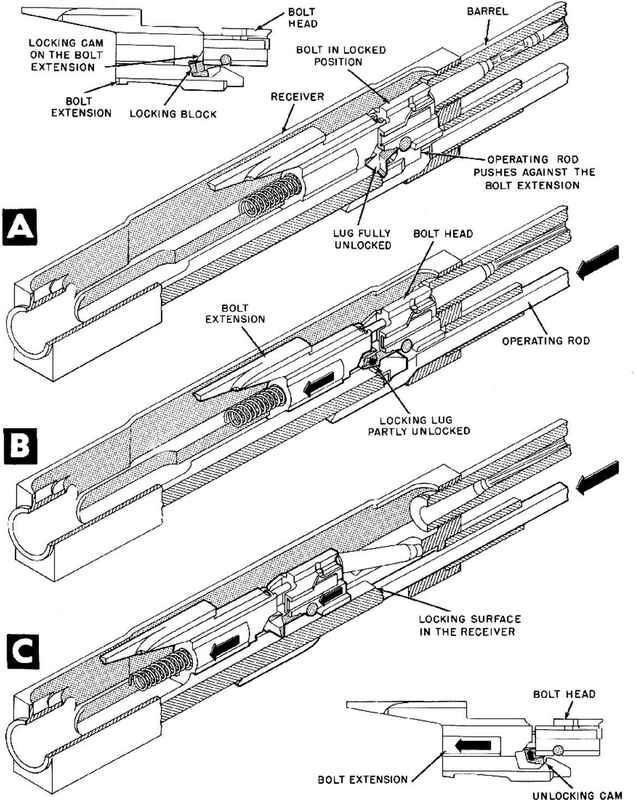 Sincc the piston at this time does not exert any force on the gun (except perhaps through a relatively weak piston return spring), the rearward pressure on the piston docs not have any effect on the recoiling gun mass. On the other hand, forward pressure on the front cylinder face is transmitted directly to the gun and acts to oppose the recoil motion. In other words, after the projectile passes the gas port, the pressure in the gas cylinder produces a retarding impulse on the gun which is equal to the impulse imparted to the gas piston.